Find out if you need to report a code for removing a soft tissue abscess. Although the term “sequestrectomy” sounds complex, you can simplify these procedures by breaking down the condition — chronic osteomyelitis. Your surgeon will want to arrest the infection, reduce pain, while retaining the function and structure of the limb — all reasons why he may perform a sequestrectomy. Definition: Sequestrectomy is a procedure that your surgeon does to remove a segment of dead bone that separates from the surrounding healthy bone. “This procedure is done if the infection has resulted in an area of bone that dies and separates from the surrounding bone or sequesters itself, thus the term sequestrectomy,” Mallon says. Note: “Saucerization is another term you may see which is removal of all dead bone and tissue, creating a ‘saucer effect’ down to viable, clean tissue,” says Bill Mallon, MD, former medical director, Triangle Orthopedic Associates, Durham, N.C. When your surgeon does sequestrectomy to treatment a focus of chronic osteomyelitis in the shoulder, you look at what area in the shoulder is the procedure done. Depending upon whether the surgeon is operating on the clavicle, scapula, or head of humerus, you report codes 23170 (Sequestrectomy [e.g., for osteomyelitis or bone abscess], clavicle), 23172 (Sequestrectomy [e.g., for osteomyelitis or bone abscess], scapula), or 23174 (Sequestrectomy [e.g., for osteomyelitis or bone abscess], humeral head to surgical neck). Note: You report the same codes when your surgeon does sequestrectomy to treat a bone abscess in these structures in the shoulder region. Example: You may read in the operative note that your surgeon removed the section of the infected bone and did a debridement followed by irrigation. “When performing sequestrectomy, the dead infected fragment is removed, the underlying bone bed is debrided using a curette and/or rongeur. As with the other infections, the site is irrigated with antibiotic solution. Often antibiotic beads will be inserted,” Mallon says. 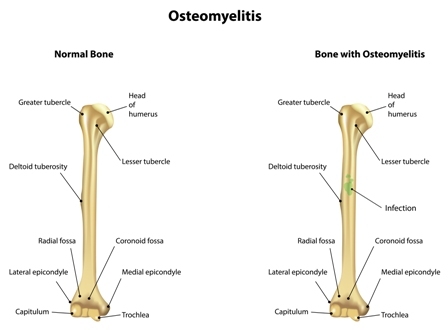 Caution: Since osteomyelitis is an infection in the bone, there is a possibility that the infection involves the surrounding soft tissues in the same area. In this case, your surgeon will be incising and draining the soft tissue abscess when operating upon the osteomyelitic focus. You do not separately report the drainage of the soft tissue abscess in the same area as this is inclusive in the codes for sequestrectomy. In difficult cases of osteomyelitis, your surgeon may do a radical excision to remove the infected tissue and the sequestrum. In this case, a larger segment of the bone may be removed to expose the underlying healthy bone and this leaves a defect to heal. “The resulting defect in the bone will have a crater or saucer appearance,” says Woodward. Example: You may read that your surgeon removed a segment of the infected bone and then irrigated the defect. For a craterization/saucerization, the area of infected bone is removed with sharp instruments such as curettes/ronguers/osteotomes and taken down to fresh bleeding bone, Stout says. Again, as with the other infections, the bone and soft tissues will be irrigated with antibiotic solution, the surrounding tissue will be debrided of any dead or infected tissue, antibiotic beads may be inserted and the wound closed. Drains are virtually always placed. “The wound may be closed over a sterile drape-type pouch, termed an antibiotic bead pouch,” Mallon says. Once again, as in sequestrectomy, depending upon the structure involved in the shoulder area, you report codes 23180 (Partial excision [craterization, saucerization, or diaphysectomy] bone [e.g., osteomyelitis], clavicle), 23182 (Partial excision [craterization, saucerization, or diaphysectomy] bone [e.g., osteomyelitis], scapula), or 23184 (Partial excision [craterization, saucerization, or diaphysectomy] bone [e.g., osteomyelitis], proximal humerus). “The technique of diaphysectomy involves partial or complete excision of the shaft of the bone,” Stout says. Note: The codes 23180-23184 apply for any partial excision be it craterization, saucerization, or excision of a segment of diaphysis. Caution: Your surgeon may or may not be draining a soft tissue abscess in the same area during the craterization or saucerization. As with the sequestrectomy, any incision and drainage of this or debridement would be part of the base procedure as long as it was in the same/surrounding area.